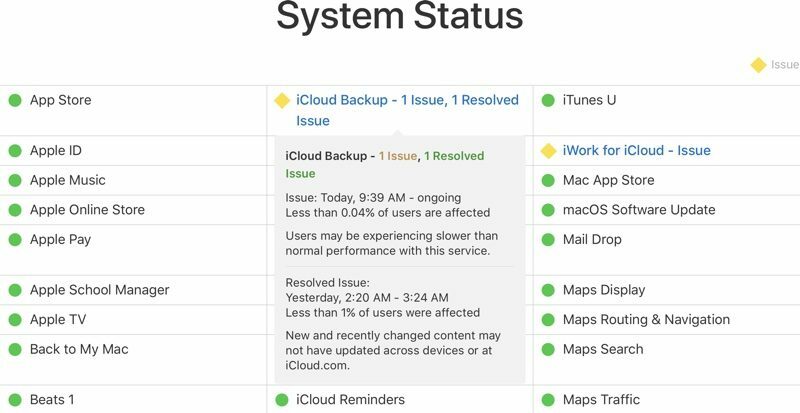 According to Apple's System Status page, a small number of users are having ongoing issues with some iCloud services, including iCloud Backup, iCloud Drive, iCloud Notes, iCloud Web Apps, iWork for iCloud, and Photos. Apple says less than 0.04 percent of users are affected by the iCloud problems, with those users experiencing "slower than normal performance." The iCloud slowdowns may be due to an Amazon Web Services outage that is affecting multiple websites and web services this morning. Over the weekend, Apple updated the look of its System Status page, and the company now provides additional information on individual services that are experiencing problems. Prior to the update, Apple used a status bar at the bottom of the page to relay problems, but now each service can be clicked for an individual report that better outlines what's going on. The page also provides a better look at past incidents that have since been resolved. It is not clear when today's iCloud problems will clear up, but customers experiencing issues should keep an eye on the System Status page for updates.